1 Publications by "B. Zavidovique"
We present a novel image feature descriptor for rotationally invariant 2D texture classification. This extends our previous work on noise-resistant and intensity-shift invariant median binary patterns (MBPs), which use binary pattern vectors based on adaptive median thresholding. In this paper the MBPs are hashed to a binary chain or equivalence class using a circular bit-shift operator. One binary pattern vector (ie. smallest in value) from the group is selected to represent the equivalence class. The resolution and rotation invariant MBP (MBP ROT) texture descriptor is the distribution of these representative binary patterns in the image at one or more scales. A special subset of these rotation and scale invariant representative binary patterns termed uniform patterns leads to a more compact and robust MBP descriptor (MBP UNIF) that outperforms the rotation invariant uniform local binary patterns (LBP UNIF). We quantitatively compare and demonstrate the advantage of the new MBP texture descriptors for classification using the Brodatz and Outex texture dictionaries. A. Hafiane, G. Seetharaman, K. Palaniappan, and B. Zavidovique. 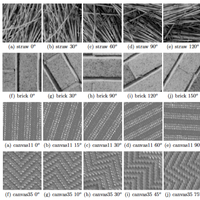 Rotationally invariant hashing of median binary patterns for texture classification. Lecture Notes in Computer Science (ICIAR), volume 5112, pages 619--629, 2008.